Disney Theatrical Productions Limited (DTP), also known as Disney on Broadway, is the flagship stageplay and musical production company of the Disney Theatrical Group, a subsidiary of The Walt Disney Studios, a major business unit of The Walt Disney Company. Founded in 1993 by longtime Disney Entertainment veteran Ron Logan as Walt Disney Theatrical, the division has gained a reputation within the industry for creating professional and popular (both critically and financially) performances, starting with Beauty and the Beast in April 19, 1994. The company is a division of Disney Theatrical Group, led by Thomas Schumacher. Walt Disney Theatrical Production, Ltd. (DTP) was formed on February 8, 1993 with Ron Logan, Disney Park's live production head, as president to produce Beauty and the Beast. Beauty and the Beast opened on Broadway at the Palace Theatre on April 18, 1994. Disney Theatrical signed a 49-year revenue based lease for New Amsterdam Theatre in May 1995. The building was renovated by Disney Development Company. With The Lion King under consideration for the next Broadway adaption, Eisner ceded DTP to theatre-rooted Disney Animation president Peter Schneider and Thomas Schumacher, at their request, making them president and executive vice president of DTP respectively. In 1997, DTP re-opened the New Amsterdam Theatre with King David followed by The Lion King musical. Peter Schneider was promoted to Disney Studios president in January 1999, while Thomas Schumacher was promoted to president of Walt Disney Feature Animation and Walt Disney Theatrical Productions, while both are made co-presidents of Disney Theatrical. On November 23, 1999, the corporate name was changed to Buena Vista Theatrical Group Limited, with Disney Theatrical Productions becoming a division of the group with the formation of Hyperion Theatricals in January 2000. Schneider left Disney Theatrical in June 2001 to form his own theater production company partly funded by Disney. His first project was developing and directing the stage version of Sister Act with Michael Reno. The musical had its official world premiere on November 3, 2006 at the Pasadena Playhouse, with DTP as an associated presenter during its Broadway run. In 2013, Disney Theatrical revealed that a show based on The Muppets was in exploratory development and that a 15-minute show had been conducted by Thomas Schumacher to evaluate the technical components. Disney Studios chairman Alan Horn in November 2013 created a deal for Disney Theatrical Productions to develop a The Princess Bride stage adaptation, possibly either a musical or play. Freaky Friday musical was developed by Disney Theatrical Productions from the book and Disney films for theatres to license. The musical premiered in October 2016 at Signature Theatre in Arlington, Virgina followed by three other threatre productions. Coinciding with the August 10, 2018 release of the Disney Theatrical Productions Disney Channel Original Movie adaptation, a one-act version of the stage musical (based on the adaptation) was made available for licensing. Disney Theatrical Productions' Newsies debuted in Australian and New Zealand cinemas on February 19, 2017. The show began previews in New York City on March 9, 1994 and officially opened at the Palace Theatre on April 18, 1994. The musical was the first Broadway adaptation by Disney, based on the 1991 animated film by Linda Woolverton and with music and lyrics by Alan Menken, Howard Ashman and Tim Rice. Several new songs were written for the Broadway musical, including Home, a ballad sung by Belle which quickly became the signature song of the musical. It ran until July 29, 2007 at the Lunt-Fontanne Theatre, to make room for another Disney production, The Little Mermaid. At 5,461 performances, the show is currently the ninth-longest run in Broadway history. It has been performed internationally first at the Princess Theatre in Melbourne, Australia and has also been performed in London, Vienna, Toronto, Kyoto, Seoul, Stuttgart, Sydney, Mexico City, Guayaquil, Johannesburg, Madrid, Moscow, Milan, Sao Paulo and has also toured around the USA and United Kingdom. In the Netherlands this production was co-produced by Joop van den Ende's Stage Entertainment with new sets and costumes. 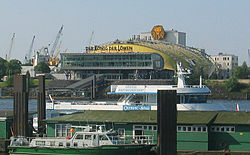 The Lion King followed Buddy – The Buddy Holly Story at the "Theater im Hafen", Hamburg. The theatre was completely renovated, by Stage Entertainment, before The Lion King transferred to Germany. The show debuted July 8, 1997, in Minneapolis, Minnesota at the Orpheum Theatre, before premiering on Broadway at the New Amsterdam Theater on October 15, 1997 in previews with the official opening on November 13, 1997. On June 13, 2006, the Broadway production moved to the Minskoff Theatre to make way for the musical version of Mary Poppins, which later was replaced by Aladdin. It is now Broadway's third longest-running show in history. The show uses a range of theatrical techniques, and is not a conventional musical. It has consistently been one of the highest grossing musicals on Broadway every week. The production won the Tony Award for Best Musical at the 1998 Tony Awards making it the first, and only, Disney musical to win. Its popularity has spawned several additional opening performances around the world, including in London, Toronto, Hamburg, Scheveningen, Sydney, Perth, Melbourne, Shanghai, Montreal, Tokyo, Paris, Nagoya, Russia, Seoul, Johannesburg, Las Vegas, Taipei, Tempe, Phoenix, Scottsdale, Mesa, Flagstaff, Madrid, Norway, Italy, Arabia, Gilbert, Scottsdale, Mexico City, Nepal, Finland, Switzerland, Chicago, Arizona, Anaheim, Poland, Milan, Moscow, Italy, and São Paulo. The musical opened on June 5, 1999, for the opening of the Musical theater Berlin (now Theater am Potsdamer Platz). After a successful run, it closed in June 2002. Directed by James Lapine, the German translation was by Michael Kunze, choreography by Lar Lubovitch, set design by Heidi Ettinger, costume design by Sue Blane, lighting by Rick Fisher, sound by Tony Meola and projections by Jerome Sirlin. This was Disney's first musical to premiere outside the US, and it became one of Berlin's longest-running musicals to date. As with Beauty and the Beast and The Lion King, Der Glöckner Von Notre Dame opened three years after the release of the movie it is based on. The musical is a darker, more gothic adaptation of the film. According to translator Michael Kunze, he was "campaigning to allow Esmeralda to die at the end, as she does in the book. There was a feeling that the audience would be depressed if Esmeralda dies. I feel that a European audience would see this as a very romantic ending ... two lost souls finally find each other. People will cry, but they'll be moved. And it is a very romantic ending." The producers wanted to see how "preview audiences react before making the final decision." In 2008, Stephen Schwartz said, "I think we're starting up Hunchback of Notre Dame, hopefully, next year (2009). Rumor has reached my ear that it's happening." Thomas Schumacher, head of Disney Theatrical, discussed current and future stage productions in an article published by the Columbus Dispatch on September 21, 2008, including an English-language production of Hunchback. The musical had its US premiere at La Jolla Playhouse from October 28 through December 7, 2014. The production was directed by Scott Schwartz and the creative team includes Chase Brock as the choreographer, Michael Kosarin as the music supervisor and arranger, Michael Starobin as the orchestrator, Alexander Dodge as the scenic designer, Alejo Vietti as the costume design Howell Binkley as the lighting designer, and Gareth Owen as the sound design. The Hunchback of Notre Dame had a workshop in February 2014. The La Jolla Playhouse production transferred to the Paper Mill Playhouse from March 4 through April 5, 2015. In 2017, the German version, with the same set decor, is playing in Berlin and München, Germany. In 2018, the production transferred to Stuttgart. The show was based on the movie of the same name and the novel Tarzan of the Apes by Edgar Rice Burroughs, and debuted on Broadway on May 10, 2006 at the Richard Rodgers Theatre. The show was heavily publicized with Phil Collins and the lead actors promoting the new musical on several media shows including The Today Show, Good Morning America, and Live with Regis and Kelly. After playing at the Richard Rodgers Theatre for over a year the show closed on July 8, 2007. On April 15, 2007, the musical debuted in Europe in the Netherlands as the successor of The Lion King in Scheveningen. A Broadway musical had never previously arrived in the Netherlands so soon after its Broadway premiere. Phil Collins was a special guest at the 2006 Johnny Kraaijkamp Musical Award s, where he announced the news that Tarzan was coming to the Netherlands. Due to the size of the Circustheater, the show was expanded beyond the original Broadway production. In 2008, a new production opened in Germany. A casting show on TV called "Ich Tarzan, Du Jane" ("I Tarzan, you Jane") searched for actors for the roles of Tarzan and Jane. A revamped tour version had previously been announced to debut in January 2009 in Atlanta at the Theatre of the Stars. The new production was supposed to feature the same music and book, and directed and choreographed by Lynne Taylor-Corbett, with scenic design by Kenneth Foy, aerial design by Paul Rubin and lighting design by Ken Billington. The production was ultimately cancelled. The musical began Broadway previews on November 3, 2007 and opened on January 10, 2008 at the Lunt-Fontanne Theatre, even through trouble due to the Local One stagehands strike, which ended on November 28, 2007. The world premiere took place at The Ellie Caulkins Opera House at the Denver Center of the Performing Arts in Denver, Colorado. The show features every song from the movie, as well as nine new songs written by Menken and lyricist Glenn Slater. The book was written by Pulitzer Prize and Tony Award-winning playwright Doug Wright, with direction by Francesca Zambello, choreography by Stephen Mear, scenic design by George Tsypin, costume design by Tatiana Noginova and lighting design by Natasha Katz. The musical on Broadway opened to mixed reviews. The original Broadway cast featured Sierra Boggess as Ariel, Norm Lewis as King Triton, Sherie Rene Scott as Ursula, Eddie Korbich as Scuttle, Sean Palmer as Prince Eric, Brian D'Addario and Major Curda as Flounder, and Tituss Burgess as Sebastian. The musical closed on August 30, 2009 after 685 performances and 50 previews. In 2012, a Dutch production premiered. In November 2010, Alan Menken confirmed that a musical theatre adaptation of the show is in the works with a book written by Chad Beguelin. The show premiered at the 5th Avenue Theatre in Seattle from July 7 to July 31, 2011. Another production played at the Muny Theatre in St. Louis from July 5 – 13, 2012. The musical premiered on Broadway on February 26, 2014 (in previews) and officially on March 20, 2014 at the New Amsterdam Theatre, taking the place of Mary Poppins, which closed on March 3, 2013. The musical had a pre-Broadway tryout at the Ed Mirvish Theatre in Toronto lasting from November 13, 2013 to January 12, 2014. Casey Nicholaw directed and choreographed, with Chad Beguelin writing the book and additional lyrics, Bob Crowley as the scene designer, and costume design by Gregg Barnes. It was also announced that the musical would open at London's West End officially in June 2016 at the Prince Edward Theatre, taking the place of the revival of Miss Saigon, which closed on 27 February 2016. On July 2, 2015, Daily Mail UK announced that a stage version of Disney's Pinocchio will be presented by the National Theatre, London in December 2016. The plot will be the mix of Disney's beloved 1940 film and the original novel with the songs, being both used & deleted songs from the movie and other songs from Disney. Creative team includes Tony winner John Tiffany as the director, Enda Walsh as playwright, Bob Crowley as set and costume designer, and Steven Hoggett as choreographer. A workshop took place in late 2015. The production was delayed due to Tiffany's involvement with Harry Potter and the Cursed Child. On 19 January 2017, it was announced by Daily Mail columnist Baz Bamigboye that the production would open in December 2017 with Tiffany directing and Dennis Kelly replacing Walsh as playwright. He also announced that artistic director Rufus Norris said the National would not take "one cent" from Disney but will use the songs. The production opened in the Lyttleton Theatre at the Royal National Theatre, London on 1 December 2017 running until 10 April 2018. On January 13, 2014, Disney CEO Bob Iger announced that a Broadway stage adaptation of the hit 2013 3D computer-animated musical film Frozen is in early development stages. On February 12, 2015, it was announced that the Broadway musical will be directed by two-time Tony nominee Alex Timbers and is aiming for the Broadway show to open in 2017. It was announced also that the film's songwriters, Robert Lopez and Kristen Anderson-Lopez, will write new songs for the show. On February 9, 2016, it was announced that the musical is scheduled to open in spring 2018. A private reading of the stage version of the musical Frozen was held in May 2016, with Elsa was played by Betsy Wolfe and Anna was played by Patti Murin. On September 27, 2016, Michael Grandage was selected to take over as the director after Timbers left the production, with Christopher Oram coming on board as the scenic designer. A pre-Broadway tryout ran at the Buell Theatre in Denver, Colorado from August 17 to October 1, 2017. The original Denver and Broadway cast included Caissie Levy as Elsa, Patti Murin as Anna, Jelani Alladin as Kristoff, Greg Hildreth as Olaf, and John Riddle as Hans. Previews on Broadway at the St. James Theatre began on February 22, 2018, with the official opening on March 22, 2018. In July 2017, Alan Menken said that he is working on a stage adaptation of the 1997 film, Hercules. The Public Theater will present the world premiere of the musical from August 30 through September 8, 2019 at the Delacorte Theater. Cameron Mackintosh's stage adaptation of Mary Poppins had its world premiere at the Bristol Hippodrome starting with previews from September 15, 2004 before officially opening on September 18 for a limited engagement until November 6. The production then moved to the Prince Edward Theatre on December 15, 2004. It was announced in June 2007 that this production would close on January 12, 2008, after a run of more than three years. To this date it is the only Disney production to premier on the west-end. A UK tour of Mary Poppins commenced in June 2008 and ended in April 2009. The Broadway production opened on November 16, 2006, following a month of previews in the New Amsterdam Theater. The Broadway production closed on March 3, 2013 after 2,619 performances. A North American tour of the show began at Chicago's Cadillac Palace Theatre in March 2009. An Australian production opened at Melbourne's Her Majesty's Theatre in July 2010. A Dutch production opened in April 2010 at the Circus Theater in Scheveningen. A Czech production opened at Brno City Theatre (Městské divadlo Brno) in November 2010. A Mexican production opened at Centro Cultural Telmex on November 14, 2012, with Bianca Marroquín as Mary. An Icelandic production opened in February 2013 at the Reykjavík City Theater. It is the most expensive, difficult and successful show to be produced in Iceland. The Austrian production opened at Vienna Ronacher on October 1, 2014. In 2017, The German version will be playing in the Apollo Theatre in Stuttgart. The show will transfer to the Theater an der Elbe in Hamburg in 2018. In September 2018, it was announced that Mary Poppins would be receiving a west-end revival to open in late 2019, following the closure of Aladdin on the west-end. It will re-open at its original theater, the Prince Edward Theatre. The hit Disney Channel movie High School Musical was adapted for the stage in 2007. It had its world professional premiere at the Theatre of the Stars in Atlanta, Georgia. A US tour began on August 1, 2007 and ended on August 3, 2008. A West End production opened in July for a limited run. High School Musical has performed internationally in Japan, Spain, Italy, South Africa, Australia, Netherlands and South Korea. High School Musical is licensed through Music Theatre International and has been performed by over 5,000 theaters throughout the world. Currently there is a Full Length version, One-Act Edition and JR one-hour version designed specifically for middle-school aged performances. Main article: High School Musical 2: On Stage! A stage version of the sequel movie High School Musical 2 was released as a stage version in October 2008. Like the original, the show exists in a full length version, One-Act Edition and a one-hour-long JR version designed for middle-school aged performers and is licensed through Music Theatre International. A musical version, based on the 2010 film Camp Rock 2: The Final Jam and features the songs from the first two Camp Rock films. The Gardiner Spring Auditorium in Ontario, California on August 5, 2010 and has performed internationally worldwide. The musical is licensed through Music Theatre International. The show, based on the 1992 film, features a book by Harvey Fierstein and music by Alan Menken and Jack Feldman. A reading of the musical was held in New York on December 10, 2010. The musical premiered at the Paper Mill Playhouse (Millburn, New Jersey), in September 2011 with Jeff Calhoun as director. "Disney representatives stated that the production was not eyeing a Broadway berth, but is being explored as a property for licensing by professional and amateur groups." However, due to enthusiastic reviews, the show opened on Broadway on March 29, 2012, at the Nederlander Theatre with an open-ended run. The show was nominated for eight Tony Awards, including Best Musical, winning Best Choreography and Best Original Score. Newsies gave its final Broadway performance on August 24, 2014 while heading out for a national tour in October 2014. The production was filmed and premiered in cinemas on February 19, 2017. A musical version of the film, with a book by Bridget Carpenter and a score by Ryan Scott Oliver, was expected to have a "developmental production" at the La Jolla Playhouse in spring 2012. Christopher Ashley was named as "likely" to be the director. A developmental lab is set for 31 March through 10 April 2015. Ultimately music and lyrics fell into the hands of Tom Kitt and Brian Yorkey of If/Then and Next To Normal fame. The premier engagement occurred at Arlington Virginia's Signature Theater from October 4 to November 20, 2016, under the direction of Christopher Ashley. The creative team included choreography by Sergio Trujillo, music supervision by Bryan Perri, orchestration by Michael Starobin / Tom Kitt, scenic design by Beowulf Boritt, costume design by Emily Rebholz, lighting by Howell Binkley and sound design by Brian Ronan and Kai Harada. The west coast engagement at the La Jolla Playhouse (January 31, 2017 - March 19, 2017) reprised most of its Signature Theatre creative team and cast. The Studio Cast Recording album was released by Walt Disney Records on February 10, 2017. Disney plans to adapt William Goldman's The Princess Bride into a stage musical. Disney Theatrical is already in early talks with Burton and screenwriter Linda Woolverton, to develop the 2010 film of the same name into a Broadway musical. Woolverton authored the screenplay for Disney's The Lion King and is also the Tony Award-nominated book writer of Beauty and the Beast, Aida, and Lestat. Burton will also render the overall designs for the stage musical. Woolverton will adapt her screenplay for the stage production. Neither a composer nor songwriting team has been chosen yet. Robert Jess Roth is set to helm the stage musical that will have choreography by Matt West. The duo also collaborated on Disney's first Broadway outing: Beauty and the Beast. No casting has been announced. A stage musical version of the film is in development with Bartlett Sher as expected director. A stage musical adaptation of the film is scheduled to make its world premiere at the Yard at the Chicago Shakespeare Theater from May 30 to July 28, 2019 as part of its 2018/19 season. King David is a musical, sometimes described as a modern oratorio, with a book and lyrics by Tim Rice and music by Alan Menken. The musical is based on Biblical tales from the Books of Samuel and 1 Chronicles, as well as text from David's Psalms. Aida is a musical based on the opera of the same name by Giuseppe Verdi. It has music by Elton John, lyrics by Tim Rice, and book by Linda Woolverton, Robert Falls, and David Henry Hwang, and was originally produced by Walt Disney Theatrical. Debuting in November 2004, the show brought together sixty classic Disney songs from 1930 right up to 2004. They are woven together loosely by a storyline which is set in a recording studio with young (and old) performers using the songs to express their moods and the interrelationships among the characters they portray. The show played at the National Theatre in Washington D.C., as well as other theatres on a national tour. Disney Theatrical Productions and La Jolla Playhouse (California) adapted Peter and the Starcatchers, which is a prequel to the Peter Pan story, into a play with music. The new play is written by Rick Elice, co-directed by Roger Rees and Alex Timbers, and is based on the novel by Dave Barry and Ridley Pearson. It was produced as part of La Jolla Playhouse's Page to Stage program, and ran from February 13, 2009 through March 8, 2009. An Off Broadway production opened at New York Theatre Workshop  It moved to Broadway on April 15, 2012. The show ended its Broadway run on January 20, 2013, and reopened Off-Broadway once again at New World Stages in March 2013. In November 2013, Disney Theatrical Productions, announced plans to mount a stage version of the film Shakespeare in Love in London, with Sonia Friedman Productions as co-producer. The West End production played at the Noël Coward Theatre, with the world premiere scheduled for July 23, 2014. Based on the screenplay by Marc Norman and Tom Stoppard, it has been adapted for the stage by Lee Hall. The production is directed by Declan Donnellan and designed by Nick Ormerod, the driving force behind the noted theatre company, Cheek by Jowl. However, it was announced that the production would close on 18 April 2015. The ABC television special Backstage with Disney On Broadway: Celebrating 20 Years aired on December 14, 2014. ABC’s “Nashville TV show duo, Clare Bowen and Sam Palladio, performed “Beauty and the Beast” musical for the special. ^ a b Simonson, Robert (January 12, 1999). "Thomas Schumacher Promoted to Co-President of Disney Theatricals". Playbill. Retrieved July 28, 2015. ^ a b "Buena Vista Theatrical Group Ltd". Business Entity search. New York Secretary of State. Retrieved July 31, 2015. ^ Kennedy, Shawn G.; Lesser, Ellen C. (May 12, 1995). "Disney and Developer Are Chosen To Build 42d Street Hotel Complex". New York Times. p. B2. Retrieved July 30, 2015. Disney has signed a 49-year lease to the 92-year-old New Amsterdam Theater, though it can get out of the deal by July 15 if certain conditions are not met. ^ Singer, Barry (October 4, 1998). "Theater; Just Two Animated Characters, Indeed". New York Times. Retrieved August 10, 2015. ^ "Disney Creates New Theatre Division, Hyperion Theatricals". Pay Bill. January 31, 2000. Retrieved July 28, 2015. ^ Lyman, Rick (June 21, 2001). "Chairman of Disney's Studios Resigns to Return to Broadway". New York Times. Retrieved August 10, 2015. ^ Hernandez, Ernio (November 3, 2006). "Sister Act — Musical Based on Film — Opens World-Premiere Run Nov. 3". Pallbill. Retrieved August 15, 2015. ^ Isherwood, Charles (April 20, 2011). "Different Church, More Sequins". New York Times. Retrieved August 15, 2015. ^ Cox, Gordon (June 11, 2013). "Disney Theatrical Eyeing Muppets On Stage (EXCLUSIVE)". Variety. Retrieved June 12, 2013. ^ Cox, Gordon (November 11, 2013). "Disney Theatrical Developing 'The Princess Bride' for the Stage". Variety. Retrieved January 7, 2019. ^ Rothstein, Mervyn (October 4, 2016). "What To Expect from Freaky Friday the Musical". Playbill. Retrieved October 24, 2018. ^ Gans, Andrew (June 27, 2018). "Freaky Friday Musical Will Be Available for Licensing Through MTI". Playbill. Retrieved August 16, 2018. ^ a b Pedersen, Erik (September 29, 2017). "'Freaky Friday' Musical Set At Disney Channel Starring Heidi Blickenstaff & Cozi Zuehlsdorff". Deadline. Retrieved January 7, 2019. ^ a b c "Disney's Tony Award-Winning Musical Newsies to Make Australian and New Zealand Cinema Debut". BroadwayWorld.com. December 5, 2016. Retrieved January 7, 2017. ^ "Paper Mill Season Will Feature Can-Can, Hunchback, Ever After, Vanya and Sonia and More". playbill.com. February 26, 2014. Archived from the original on March 2, 2014. Retrieved February 26, 2014. ^ "Disney's 'Tarzan' to close July 8 on Broadway". USA Today. June 24, 2007. Retrieved April 20, 2009. ^ Gans, Andrew (January 4, 2008). "Revamped Tarzan Will Debut in January 2009 in Atlanta". Playbill.com. Archived from the original on January 5, 2008. Retrieved January 5, 2008. ^ Hetrick, Adam (December 1, 2008). "American Musical Theatre of San Jose Cancels Productions of 42nd Street, Tarzan and Closes Doors". Playbill.com. Archived from the original on December 5, 2008. Retrieved December 2, 2008. ^ "Baz Bamigboye on Twitter". Twitter. Retrieved January 19, 2017. ^ Cox, Gordon (February 9, 2016). "'Frozen' Musical Sets Broadway Timeline, Creative Team". Variety. Retrieved February 9, 2016. ^ "Review Roundup: What Did The Critics Think of Broadway-Bound Frozen in Denver?". BroadwayWorld.com. September 15, 2017. ^ "Breaking: Mark Your Calendar! Frozen Announces Opening Night on Broadway". BroadwayWorld.com. August 23, 2017. ^ BWW News Desk. "Will Disney's HERCULES Go the Distance to Broadway? Alan Menken Reveals Stage Version in the Works" Broadway World, July 10, 2017. ^ BWW News Desk. "Breaking: Bless My Soul! Public Theater Will Stage HERCULES at the Delacorte Theatre This Summer" Broadway World, February 6, 2019. ^ a b Cox, Gordon (March 12, 2011). "'Alice,' 'Freaky' head to stage". Variety. ^ Osatinski, Amy (2019). Disney Theatrical Productions: Producing Broadway Musicals the Disney Way. New York: Routledge. pp. 16–17. ISBN 978-0367075835. ^ Cox, Gordon (June 22, 2014). "Disney's 'Newsies' Ends Broadway Run in August". Variety. Retrieved January 7, 2017. ^ "Stage Adaptation of Disney's Bedknobs and Broomsticks Sets Chicago World Premiere". Playbill. Retrieved April 1, 2018. ^ "Season Announcement". Chicago Shakespeare Theater. Retrieved April 1, 2018. ^ "bartramandhill". bartramandhill. Retrieved April 1, 2018. ^ Cox, Gordon (November 13, 2013). "Disney Theatrical Gets Busy with 'Shakespeare in Love' and 'Newsies'". Variety. Retrieved July 11, 2014. ^ Cox, Gordon (July 7, 2014). "First Look: 'Shakespeare in Love' on the West End". Variety. Retrieved July 11, 2014. ^ Paulson, Dave (November 29, 2014). "Clare Bowen, Sam Palladio sing Disney tune for TV". The Tennessean. USA Today Network. Retrieved January 7, 2019. This page was last edited on 7 April 2019, at 04:31 (UTC).